As the hit TV show Mad Men draws on its final season, it’s clear designers have become nostalgic for the time the show so elegantly embodies with its style. The 1960s were a time of reinvention with a free-spirited nature. 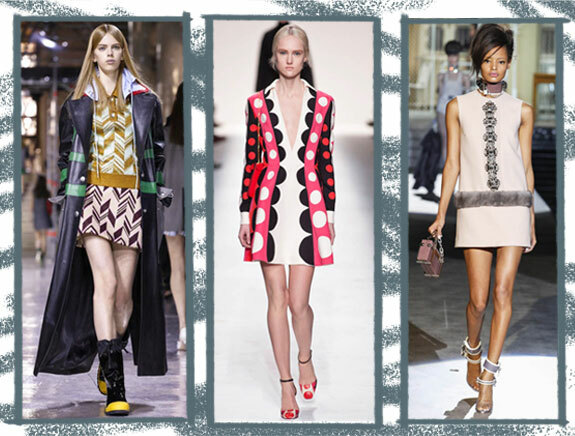 The mix of psychedelic and geometric prints from the decade have hit the runways hard for the 2014 Fall/Winter season, as we see a myriad of styles that have obviously been inspired by the 1960s. Geometric prints will be popular for the season, as seen presently from Delpozo’s retro cut geometric printed pantsuits to swing dresses from Valentino and Louis Vuitton featuring bold colored geo-prints. On the other hand, the paisley swirls and bohemian beaded details that also embody the decade of the flower child are also prevalent. The beaded shifts from designers such as Dsquared, Mary Katrantzou and Miu Miu create an updated approach to the look, yet perfectly reflect the bohemian feel of the time period. The new trend in novelty harness jewelry (a bracelet/ring combo that begins as a cuff and extends to the fingers) feels updated yet rebellious, and makes the perfect modernized complement to the 1960s trend. From bohemian styles like the leafy silver harnesses from Alexander McQueen or Badgley Mischka’s embellished chain mesh with floral details, to more modern silhouettes such as the metal chain harness from Aigner or the simple chain connector version from Mara Hoffman, the harness only adds to the avant garde nature that 1960s style represents. ← Google+ Hangouts: Why Your Company Should Use Them!